Today was very uneventful from an SCT viewpoint. It was one of those 'boring days' that Amy Morgan was hoping for, which meant that things were going to plan. I decided that some exercise would be good, and I dressed up in my blue overall to walk the corridors. 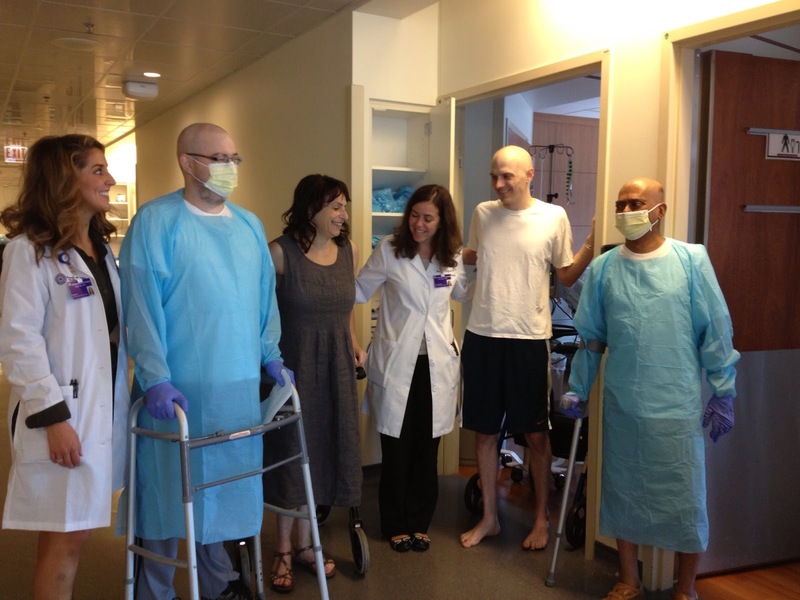 As I left the room, I met with Bryan, Monique and Doug who were also undergoing SCT. It was good to meet other people going through the same experience. We were later joined by Amy Morgan and Kelly Voth. The highlight of my day was a visit from my buddy Ramgopal Vallath who was on his annual follow-up. RamG is 2 years post SCT, and meeting him earlier this year on Facebook and again in person when he visited London was a Eureka moment for me. The internet is a powerful tool! I had met with Dr Burt in the morning, and it turns out that RamG and Dr Burt had indulged in a glass or more of wine the night before. Dr Burt informed me that my visitor might be a bit late as Dr Burt had left RamG in a drunken stupor. Perhaps Dr Burt is extending his outcome measures to cover the post-SCT effect of alcohol. MGK I heard the story of you traced him down by chance from Achu Aunty. Everything works out eventually.